(Portland, Oregon) – A log home in Portland and a railroad station in Salem have become part of the National Register of Historic Places. The Salem Southern Pacific Railroad Station is Salem's latest entry. 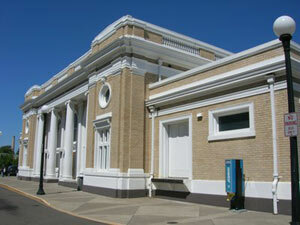 Constructed in 1918 as Salem's third railroad station, the Salem Southern Pacific Railroad Station played a significant role in the growth of Oregon's capital city. Constructed in 1918 after the majority of Salem's second 1889 railroad station was destroyed by fire, the main station building is a rare surviving example of a Beaux Arts style train station. The station's ornate Beaux Arts style is symbolic of the importance and dignified role the capital city plays in representing the entire state of Oregon. The railroad station is also significant for its central role as means of ingress and egress to and from the city over time, transporting troops during wartime, and hosting famous politicians conducting "whistle stop" campaigns during the twentieth century, including former Presidents Woodrow Wilson, Warren G. Harding, Herbert Hoover, and Dwight Eisenhower. Oregon's State Advisory Committee on Historic Preservation recommended the building's nomination in October 2009. The Salem Southern Pacific Railroad Station joins 67 other resources listed in the National Register in Salem. The National Register is maintained by the National Park Service under the authority of the National Historic Preservation Act of 1966. In Portland, the Arnold-Park Log Home is the new kid on the block of old places for that town. Constructed between 1907 and 1917 by owner John Arnold, the Arnold-Park Log Home embodies the ideals of the Arts and Crafts movement as reflected in unique owner-designed and built log-and-frame residences. Created in the tradition of a rural recreational retreat, the log home served as an escape from the stress of early twentieth century Portland life. Although the log home shares some characteristics of other rustic log cabins constructed during this same period, the building also displays Craftsman style details and is significantly more refined on both the exterior and interior. Although Arnold only resided full-time in the house for the last two years of his life, the David and Nancy Park family resided at the property from 1951 to 2004. In 2004, the property was transferred to the Oregon Parks and Recreation Department and became part of Tryon Creek State Park. Oregon's State Advisory Committee on Historic Preservation recommended the building's nomination in October 2009. 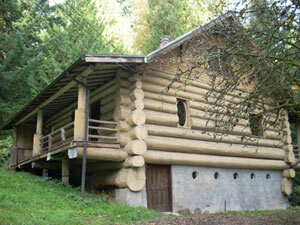 The Arnold-Park Log Home joins 56 other Craftsman style resources listed in the National Register in Portland. The National Register is maintained by the National Park Service under the authority of the National Historic Preservation Act of 1966. More information about the National Register and recent Oregon listings is online at www.oregonheritage.org (click on "National Register" at left of page).